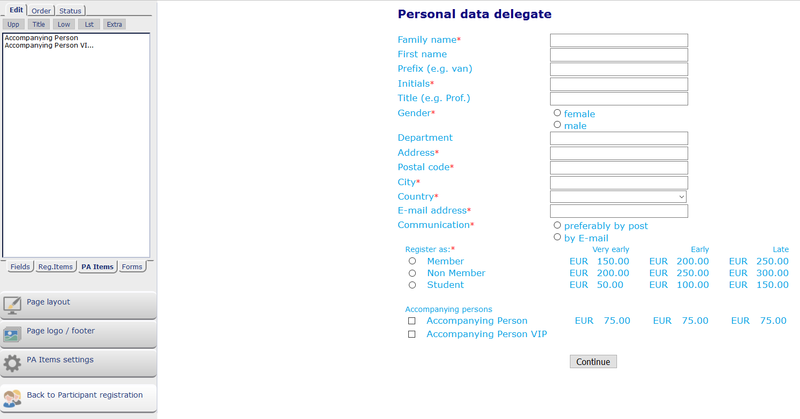 Go to the page ‘Personal data delegate’ on the internet. Below the normal P-events you will find the PA-events (the events for the accompanying persons). In the example the header ‘Accompanying persons’ is made to separate the P-events and the PA-events. You can make changes in the PA-events by clicking on the tab ‘PA items’. Changes in the ‘Upp’, ‘Title’ and ‘Low’ can be done in the same way as at the other fields. By using ‘Item Settings’ the following screen will be opened. At ‘number’ you can indicate how many accompanying persons a participant can choose. When you fill in 1, the option in the screen will be a checkbox and this event can only be chosen once. Also only 1 accompanying person has to be added on the page ‘Accompanying persons’. When you fill in for example 3, the option in the menu will be a pull down menu. Now the event can be chosen maximum 3 times. Also a maximum of 3 accompanying persons has to be chosen at the page ‘Accompanying persons’. If you use the module ‘Categories on Internet’, you can indicate per PA-event for which category they are visible. You can create the categories yourself in Eventure.